-High apex in nose area with a soft bottom for uninterrupted glide over chop and forgiving steering when catching runners. The 2016 Falcon is the weapon of choice in all-round SUP racing. From flat water to extreme open ocean conditions, the Falcon will get you there first. Our international Design- and Race-Team invested a huge amount of effort to develop the new Falcon models, which represent a great step forward in Raceboard design. The overall speed during a race is influenced largely by the way the board gets on and over chop while maintaining a clean and long waterline. That’s why we put great focus on the rocker line and the nose area of the board. 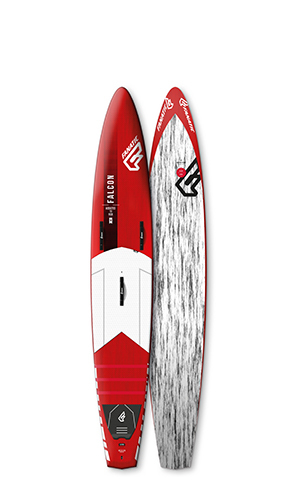 While the low rocker entry with a smooth curve throughout the board ensures a maximum speed waterline in marginal chop and flat water conditions, the nose area features high apex rails with a rounded bottom that just glides over any chop and skims across the water beautifully maintaining an uninterrupted and incredibly fast glide when conditions get rough. This combination results in a massive performance advantage and at the same time offers easy non self-steering paddling and forgiving re-adjustments when catching runners. Hard edges from center to tail ensure stability and a clean water release. The open flat-V deck allows for quickest manoeuvres, while side wind effects are reduced to the minimum by the new low volume bow. Acceleration and response time of the 2016 Falcon is enhanced by its feather light construction of carbon sandwich. The new Falcon comes in width of 24.75” (248L) and 26.75” (280L) in 12’6” – joining our two accessible 29.75”(317L) wide Falcons . The 14’0” features a drop-pintail outline for maximum control and low drag release– the winning formula when your path to the podium leads through the surf. All Falcons come with a specially designed RTM Race fin. The 2016 Falcon is incredibly fast from flat water all the way to rough and choppy conditions and an absolute pleasure to paddle in extreme Downwinders – if you are lucky enough to get them. Top quality, high spec Biax Carbon has an impeccable weight to stiffness ratio, including a fantastic dynamic flex as result of its very fine weave. Used for all Falcon 12’6” and 14’0” models as well as the Strike, maximum stiffness, along with a new matt finish optic, results in maximum weight savings.